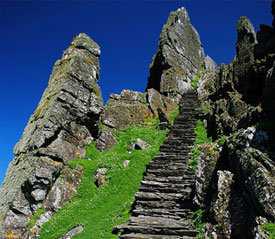 The Skellig Islands, an internationally renowned bird sanctuary, boast a wonderful array of birdlife. Breeds such as the Guillemot, the Kitewake and the unmistakable Puffin call the Skellig Islands home during the summer months. This is especially true for the Gannet, as over 20,000 pairs migrate to Little Skellig between May and September every year, making it the second largest Gannet sanctuary in the world. 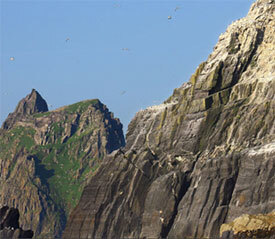 Scroll down for more on birdlife that can be seen at the Skellig Islands. 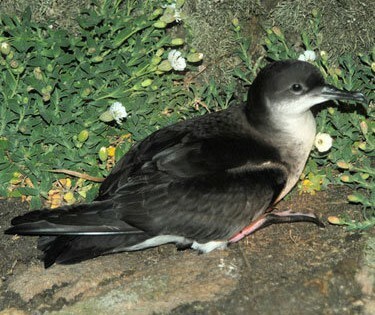 Characteristics: The contrast between the dark upper parts and the white underside along with his gliding flight over the sea makes the Manx Shearwater easily recognisable. He is rarely seen on land due to his nocturnal habits. 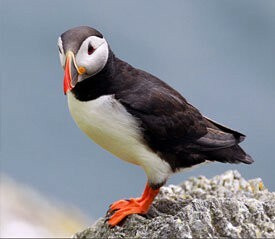 Habitat: These birds nest on rocky islands on the western coasts in deep burrows sometimes on cliffs high above the sea. Habits: Shearwaters catch their food on the surface of the sea sometimes making shallow dives. Fishing trips sometimes takes them far out to sea for days but they can navigate back to their burrows on the cliff face easily. Characteristics: A large dark seabird with a long neck and a powerful straight hook tipped bill. In breeding season the throat and thighs are white. 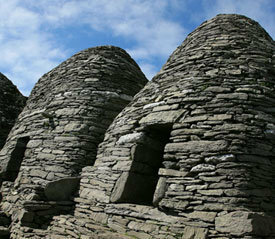 Habitat: Nests around the coast on rocky islands and cliffs but also on man made buildings. In Winter they disperse around the coast moving inland to estuaries and large lakes. Habits: Spends much of its time sitting on posts or buoys over the water, often with wings outstretched. Dives from the surface for fish. Sometimes known as ducky divers. Characteristics: A medium sized tern with a black cap, red bill and very short red legs. Very similar to the Artic Tern, but their underside is whiter and wings are darker. The bill and legs are slightly shorter and in flight the forked tail shows shorter streamers. Habitat: Common visitor to Ireland during the Summer months. Fishes further out to sea than other Terns and is seldom seen inland. Winters in Africa and the Eastern Mediterranean region. 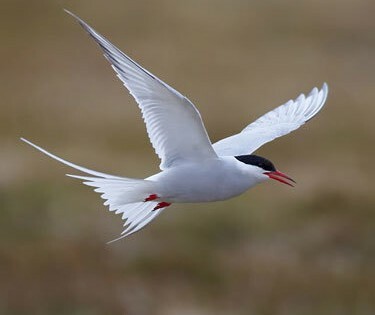 Habits: Usually the first of the terns to arrive in the spring. Dives for fish and sand eels are a favourite. 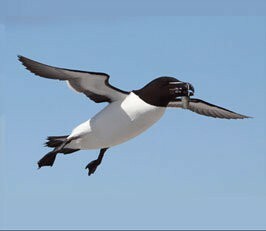 Characteristics: Razorbills are black with white underparts and a sharp bill, as the name implies. The bill is latterly compressed and is crossed by a white line running to the eye. In Winter their cheeks and throat become white. Flight appears fast, usually low, and the wings are also used underwater in pursuit of fish and crustaceans. Habitat: Breeds on rocky cliffs and islands forming quite large colonies, in suitable areas. Habits: Dives for fish from the surface, and swims well undersea using wings as flippers. 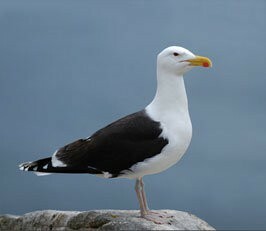 Characteristics: Gull-like but stockier with a thicker head and neck. Fulmars have greyish upper parts and a white head and body. Their ‘tuber nose’ bill and straightness of the wings in flight make identification easy. Habitat: Common around all coasts with nesting ledges. In Winter the Fulmars disperse over the sea often following fishing boats for discarded fish scraps. 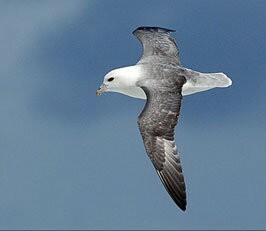 Habits: Intruders to the nest are attacked with a vile-smelling oil which the Fulmar spits at them. The birds may also spend hours gliding past a possible nesting ledge trying to land on it, only to be repelled by other birds. Characteristics: A very large gull with a black back and wings. Its massive yellow bill has an orange spot at the tip and its legs are flesh –coloured. Often seen standing on an outcrop surveying the surrounding coastline. Habitat: Breeds on rocky coasts and islands. 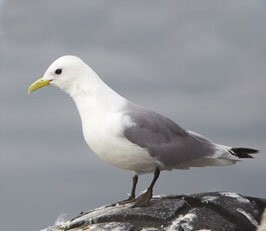 Found with other nesting seabirds but in the Winter may disperse widely sometimes gong inland to join other gulls. Habits: Able to consume quite large prey such as nesting auks or rabbits and often their solitary nests are littered with bones of their prey. Characteristics: Their size and shape resemble that of the Herring Gull. However, these have a dark slate-grey back with slightly proportionately longer wings and yellow legs. In Winter, they have a streaky yellow head with yellowish-pink legs. The birds juveniles are difficult to separate from the young herring gulls, but they do tend to be darker. The shade of colour on the back and wings deepens from grey in south of range to black in the Baltic region. Habitat: The bird breeds on low-lying coasts and islands, usually with higher vegetation than the Herring Gull, also on inland moors and bogs. Outside the breeding season they can be mainly found on the coast, but also regulars on inland lakes. They hunt over open sea but can be found over rubbish tips. Their call is similar to Herring Gulls, but slightly deeper in pitch. Habits: These birds can be interbred with the Herring Gull. However, it normally behaves as a good species, with differences in habitat, behaviour, leg, beak and back colour. 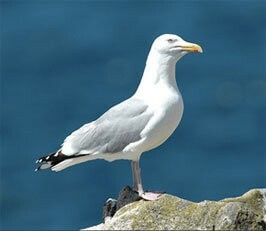 Characteristics: The herring gull is white with a pale grey back and wings. Their wings are black tipped while they possess a powerful yellow and red spotted bill, yellow eyes and can be seen to have pink feet. In Winter, the birds head has brownish streaks. Juvenile herring gulls are speckled brown, with a black terminal tail-band, gradually attaining adult plumage in the fourth year. They have a very vocal call with a repeated ‘kyow’. Their alarm call on their breeding ground resembles a ‘ga- ga- ga’ sound. Habitat: The bird can be found in coastal meadows, dunes, on shingle banks, small islands and rock ledges during breeding season. In some cases they can be found on buildings. Outside their breeding season they are usually found on the coast, but also on inland water and rubbish tips. Habit: Tend to remain fairly local. They have developed more of a liking to refuse tips, sewage outlets and fish quays: in fact anywhere which provides rich pickings. Characteristics: A medium sized gull with a dark chocolate brown hood in Summer, with a red bill and legs. During the Summer months, the hood does not extend as far as the nape. In Winter it is reduced to dark smudges behind the eyes. The upper wings show large triangular white panels at the tips in flight and the under wings are grey looking, darker towards the tips. Habitat: A common breeding bird on freshwater and marshes. Often nests in large colonies. Disperses over the oceans and inland waterways in Winter. 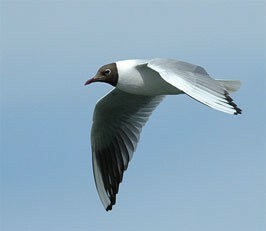 Habits: The black headed gull is a noisy and gregarious gull feeding on a wide variety of foods. Characteristics: A small gull, with a rounded white head, narrow yellow bill, dark eyes and greenish yellow feet. In Winter the white head is streaked with brownish marks. There is a chuckling ‘kak- kak- kak’ call made when birds are in large migrating flocks. Habitat: Breeds commonly on the coasts of Northern Britain, Baltic and Scandinavia, and migrate south and west for the Winter. Habits: May feed some distance from the sea, taking insects and soil invertebrates on farmland; also feeds at sea usually in noisy flocks. Characteristics: A black and white sea bird with a narrow pointed bill. Often has a white eye-ring and narrow stripe behind its eye. In Winter, cheeks, chin and neck are white with a dark line behind its eye. 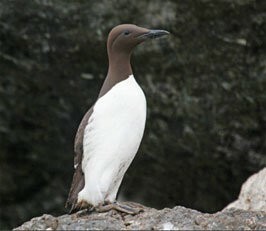 Habitat: Guillemots breed on inaccessible cliffs on rocky coasts and islands, with some colonies containing thousands of birds. In Winter, most of them go far out to sea, but occasionally inshore due to bad weather. 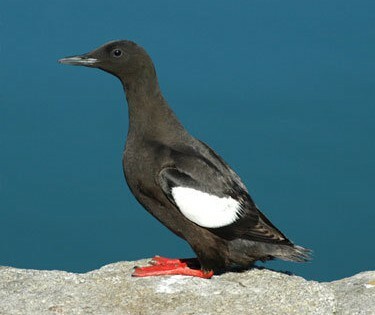 Habits: Guillemots dive for fish from the surface. 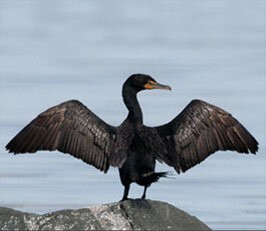 They also swim well under water using their wings and like to often sit upright on the nesting ledges. Characteristics: Adult birds have black bodies with a white wing patch, a thin dark bill, and red legs and feet. They show white wing linings in flight. In winter, the upperparts are pale grey and the underparts are white. The wings remain black with the large white patch on the inner wing. They are 32–38 cm in length, and posses a 49–58 cm wingspan. Habitat: Their breeding habitat is rocky shores, cliffs and islands on northern Atlantic coasts, in eastern North America as far south as Maine, and in western Europe as far south as Ireland.They are one of the few birds to breed on Surtsey, Iceland – a new volcanic island. In the UK it is a fairly common breeding bird in western and northern Scotland and also in the Republic of Ireland. Habits: These birds often overwinter in their breeding areas, moving to open waters if necessary, but usually not migrating very far south. They dive for food from the surface, swimming underwater. They mainly eat fish and crustaceans, also some mollusks, insects and plant material. The call in the breeding season is a high whistle. The red gape is also prominent during this period. Characteristics: A medium sized tern with a black cap, a red bill and very short red legs. Very similar to the Common Tern – however, the Arctic Tern’s tail streamers are longer and wings are narrower. Habitat: Common on shingle shores and rocky islands. 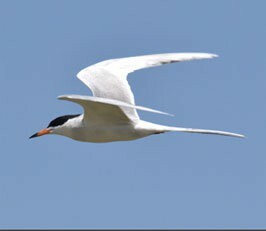 Often nests in mixed colonies with the Common Tern. Migrate south in the Winter. Habits: Dives for fish from the air but will also eat small crustaceans and insects from the surface of the water. Will pursue insects in flight. 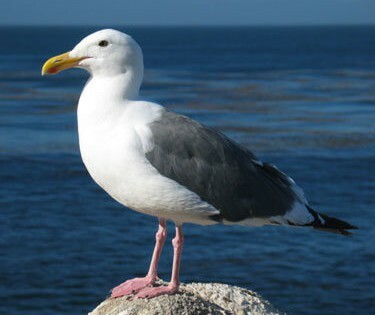 Characteristics: A graceful, medium sized gull with short black legs and webbed feet. The Kittewake’s claws enable it to grip on narrow rock ledges. 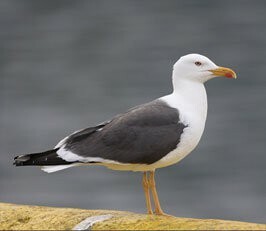 Its grey wings have black tips but unlike the Common Gull, it lacks white patches at the tips and also the orange spot on the small yellow beak. Juveniles have a dark zig-zag pattern on their upper wing and a black band across the back of their neck. Habitat: Breeds on rocky coasts, nesting in large, noisy colonies on steep cliffs and disperse over the Atlantic, North Sea and Western Mediterranean in Winter. Habits: Kittiwakes feed on the open sea on small surface- feeding fish and offal they pick from the surface. They make a far-carrying ” Kitti-wake” call incessantly at the breeding colony. 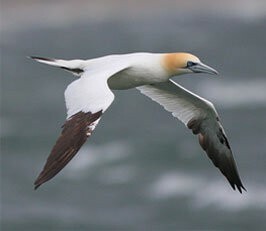 Characteristics: The Gannet is the largest seabird of the area. The Gannet is gracefully black and white, with a pointed head and tail. It also possesses long, rather narrow black tipped wings. Habitat: Gannets breed on rocky islands and steep mainland cliffs, in huge colonies. Large colonies are home to 70% of the world’s gannets, with half of the whole population in just 5 sites- St.Kilda, Bass Rock, Ailsa Craig in Scotland, Grassholm in Wales, & little Skelligs in Ireland. Gannets were first mentioned as being on the Skellig in the year 1700, in what was described as “incredible numbers”. The estimated population of these birds on the little Skellig is in the region of 20,000 pairs. Habits: Gannets dive steeply into the sea from great height to capture their prey, which usually consists of large fish including Herring and Mackerel. At the breeding colony they are noisy and aggressive to intruders. Characteristics: An unmistakable black and white seabird with a massive colourful bill. The Puffin’s face is white in the breeding season and the eyes are surrounded by a colourful eye-ring. The large red and yellow bill plates are shed in the Winter and it is then smaller and less colourful. Habitat and distribution: Breeds in sometimes-huge colonies on grassy cliffs and islands where burrows are excavated. Some nesting material is used and a single egg is laid. More numerous in the far northern colonies but there have been huge decline in some areas. Habits: Dives for fish. Especially sand eels and can carry several fish at once due to serrated bill. At the breeding colony, large numbers may gather in the evenings outside their burrows then suddenly disappear below ground. In Winter, Puffin’s may be confused with Razorbills. Characteristics: A very small, black seabird with an obvious white rump. Its dark bill has tube nostrils and a slightly hooked tip. It flies low over the water with dark feet trailing, which picks small items of food from the surface. Only seen inland during breeding season and a strange churring call ending in a ‘hiccup’ is heard near nesting burrows. 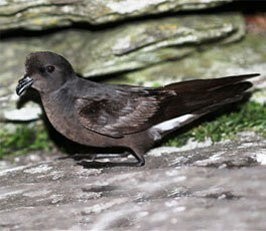 Habitat: The Storm Petrel nests on rocky islands and steep cliffs in burrows and crevices. In Winter they are found far out at sea south of the main breeding range. Habits: Small size, fluttering, flight and habit of picking food from the surface without alighting make them easy to identify.